Question: Why do the calyxes of my carnations break and let the petals spill to one side? Also, could the rustlike disease on stem and leaf be red spider? What should I do? Answer: Splitting of the carnation calyx may be due to improper soil mixture, thrips or red spider, uneven temperatures or insufficient light. Also, some varieties split worse than others. Correct these things and much of the splitting will be eliminated. The rust-like spots on stem and leaf are rust, not red spider. A close damp cold atmosphere will encourage rust. Infected leaves should be removed and destroyed at once. The plants should be ventilated and watered so as to keep them dry if this is possible. Otherwise, spray the plants with zineb or captan. Question: Why won’t my carnation plant bloom? I planted a slip from another plant, turning a glass over it until it rooted; it grew very well and formed a bud, but the bud dried up before it bloomed. 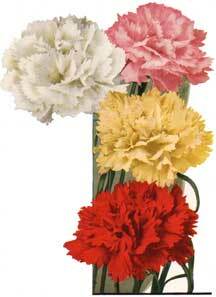 Answer: After a carnation cutting starts to grow it should be pinched. This induces side branches to form and makes a bushy vigorous plant which will support numerous blooms later. When the stem starts to elongate to produce a bud is when the top should be pinched off. Likewise, most of the growths that start after the first pinch should be pinched off when long enough. After this second pinching the plant should be heavy and shapely and should be permitted to flower. Question: How shall I prepare my carnations for winter? Answer: In September cut all old flower stems back to retain a well shaped plant. When you are through pruning, the plant should be a shapely, short, bushy tuft. From then until spring practically no attention is required. The plants should not be mulched with manure or other materials that hold moisture around the collar of the plants, for this causes them to rot. The ground should be firmed around the plants in early spring for the tearing and heaving effect of freezing and thawing lifts the plants and often kills them. Question: I have several carnations that seem to be diseased. The leaves turn yellow and curl up, and a slimy substance is over some of the lower stems. What is the trouble, and how may I prevent it? Answer: Stem rot, caused by a fungus is the most generally destructive disease of of carnations, when excessive water and high temperatures appear together. Any fungus thrives where there is lots of moisture, stuffy air and cloudy weather. The best preventive is cautious and moderate watering and cleanliness to permit free access of air to and around the plant. When a diseased plant is detected it should be removed together with the soil at its base. This will prevent the fungus from spreading.